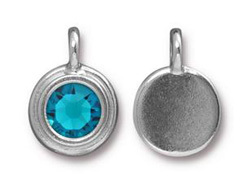 TierraCast Lead Free bright rhodium plated pewter charm with Swarovski SS34 stone (7.2mm round) in Blue Zircon color. This charm is about 16.6mm tall (including loop, and 11.6 round. Loop has an internal diameter (ID) of about 2,6mm..This is also a birthstone charm for Decemeber month.